We are so excited to open our doors to our new shop in the ski capital of the world, Aspen, Colorado. “Having skied for over thirty years, Aspen has always been a dream location of mine for Sweaty Betty,” says Tamara Hill-Norton, Founder and Creative Director of Sweaty Betty. “With some of the best slopes and après ski in the world, it’s the perfect place for our new retro ski collection and printed base layers. I’m visiting in February for the first time and I am so excited". To celebrate our beautiful shop, we've curated where to eat, stay and workout in this famous destination. We hate to state the obvious, but the skiing here is excellent—thanks to four separate mountains, each with their own unique personality, there’s almost endless terrain. Our personal favourites are Snowmass and Aspen Mountain, though if you're a beginner try Buttermilk, the least steep of the four. 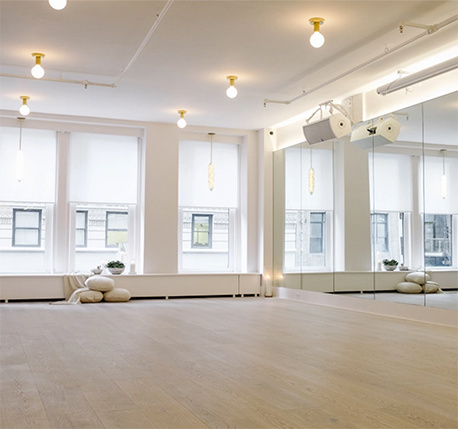 Part boutique, part spa, part studio, we love O2 Aspen for their Pilates and yoga classes. If you can't live a week without the reformer this is the studio for you, as it's one of the only places in town with machines and equipment. The idea place to stretch out any skiing aches, this airy, heated yoga studio is famous for its challenging Ashtanga classes. Head to Arunja Hot Yoga to escape for an hour of zen. If you've eaten a bit too much pizza, pasta and fondue, then Pyramid Bistro may be the answer. Head Chef Martin Oswald trained at health resorts in the Austrian mountains, so expect fresh, healthy salads and locally sourced organic ingredients. Nobu's Aspen outpost, Matusuhisa is a must-visit for a post ski date night, though warning, on busy weekends, reservations book out as early as a month in advance. If you do manage to get a table, try the jalapeño yellowtail, and sashimi, you won't regret it. If you're looking for the authentic Aspen experience, then White House Tavern is the place. Set in an adorable, white Carpenter Gothic house with a signature red door, head here for comfort food and cocktails amongst the rustic decor. Aspen's most famous luxury resort, The Little Nell is the home for the see-and-be-seen scene the town is known for. Enjoy heated marble bathrooms, cozy fireplaces, mountain views, incredible service and the best après ski in town at Ajax Tavern. The historic Hotel Jerome was Aspen's first hotel when it opened over 120 years ago. Still housed in the original building, you'll be greeted by cowboys to this traditional destination with warm and stately decor and a luxe spa. As much as we love to ski and apres, there's a lot more to the town than winter sports. Aspen Art Museum hosts some of the world's best contemporary artists for group and solo exhibitions year-round. Aspen isn't only famous for skiing, the hikes in this mountain resort are a great way to explore. The Maroon Bells, one of the USA's most picturesque trails can be reached by car, though we recommend either cross country sking to reach the view, or hiking up to nearby Crater Lake via a 3.6-mile trail—it's steep, but worth it for the Instagrammable moments. A guaranteed crowd-pleaser for dog lovers, if you fancy a break from the mountains, why not ride along on a sled through the wilderness behind ten huskies. Find out more about our Aspen shop and visit us in-store at 529 East Cooper Avenue, Unit 5, Aspen, 81611. Don't forget to follow us on Instagram for more.